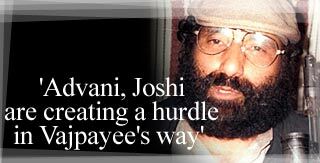 A decade after heading the largest militant organisation in Kashmir, Hizbul Mujahideen chief Syed Salahuddin bears no harsh lines on his face. A decade killing and being killed seems to have brought no grey to him. Salahuddin is, as he puts it, "50-plus" today. Bulky, of average height, he speaks imperfect English with a heavy Kashmiri accent. Apart from leading the HM, the militant wing of the separatist political party Jamaat-e-Islami. He now also chairs the United Jihad Council, the umbrella organisation of all militant outfits fighting in Kashmir. In this two-part interview with Senior Assistant Editor Chindu Sreedharan in Islamabad recently, which was updated by email, Salahuddin says the coming months will see more bloodshed in Kashmir. Kashmir militancy has cost many innocent civilian lives. See my brother, we do not actually kill the civilians. We kill the target that is combating us, the Indian forces. But if unfortunately a civilian comes in the midst, what we can do? We are helpless. But we are trying our best [not to kill]. Our code of conduct does not allow to kill, to touch any woman, old men and child or innocent person. Still it happens -- and not just accidentally. The killings of innocent villagers in Doda that followed the Agra summit were deliberate. Definitely not! Not deliberately. If anybody has done, he has done a tremendous blunder. We condemn it. There was the killings, it has shocked us very deep I swear in the name of Almighty Allah! We think it is a damaging action. A brutal one. No human body can do this! And we think it is a desired action done by Indian agencies to get this movement condemned, deprived of growing sympathy on the international level and to give it a communal touch. You blame the Indian authorities for the killings. Is there any proof you can offer for this? The massacre of Hindu brethren in Doda [in the Jammu region] was perpetrated by Indian agencies in order to strain the ongoing movement as communal confrontation pretended to crush the increasing local popular support to the movement, to defuse and divert the post-Agra storm of criticism on [the Atal Bihari] Vajpayee government. The massacre resembles that of 35 Sikhs in Chattisinghpora during Clinton's visit to India. That massacre was perpetrated by paramilitary forces, as per the report of the Pandian Commission appointed by the state government. India says some 350,000 Hindus have fled the Valley because militant organisations like yours are carrying out 'ethnic cleansing'. And that the killings in Jammu are part of this. The occupied Jammu and Kashmir has exhibited an unprecedented ethnic and communal brotherhood while more than 37,000 state-sponsored communal riots have taken place in the rest of India since 1947. Unfortunately Hindu community got betrayed and trucked out of the Valley by Jagmohan [the state governor in the initial days of militancy], who had sinisterly designed to bulldoze Muslim population after complete Hindu evacuation from the Valley. The massacre and fleeing of minority community has really shaken the confidence of Muslim community and seriously shocked them. In that case, what will the HM do to bring back the Pandits? If it is found that any other militant outfit is behind the attacks, will the HM, as the largest organisation functional in the Valley, offer them protection? HM believes in a pluralistic society, but cannot guarantee a safe influx unless confidence is restored and loyalty with the movement reconfirmed. The Indo-Pak peace talks are on in such an atmosphere of violence. What chances would you give the Islamabad talks? Now see my brother, this exercise of bilateral talks and bilateral diplomacy has been in operation right from the last more than five decades, breaking no ice. There has been Simla, there has been Tashkent, there has been Lahore declaration. Bilateral diplomacy will prove futile in future also, in case it do not follow the natural path of its course. First, two things have to be taken into consideration. Number one, the agenda of talks must revolve around the basic issue of Kashmir. Second, all the three parties have to be involved. Whether the third party may be involved in the first or second or third or fourth-fifth, but it has to be involved. If Mr Atal Bihari Vajpayeesaab displays a realistic attitude in Islamabad talks, that is give the first importance to this basic issue of Kashmir, summit will success. Otherwise not. Prime Minister Vajpayee has blamed President Musharraf for the failure of the Agra talks. He has said Musharraf shouldn't speak about the will of Kashmiris as he himself doesn't enjoy the will of Pakistan. It is not Musharraf but India's unrealistic, intransigent and dilly-dallying behaviour which has resulted in the failure of the Agra summit. The will of the Kashmiri people advocated President Musharraf. It is a historical and ground reality, which has been accepted and repeatedly endorsed by international community. Your organisation, and also many people in the Kashmir Valley, had pinned a lot of hope on Prime Minister Vajpayee. We differentiate him from other leadership. In the respect, he has the courage enough to take this decision, to invite Mr Musharraf. Which is our information is that Mr Vajapayee is determined to get his Kashmir issue resolved. But there are the hawks in bulk, like Mr [L K] Advani, Mr [Murli] Manohar Joshi, so many people, who are creating a hurdle in his way. And stressing Mr Vajpayee not to diverge from the traditional path. This present summit was a failure due to this resistance of hawks. Otherwise, Vajpayee is comparatively a man of principles and open-mindedness. Comparitively. You spoke of involving the third party, the Kashmiris. But there seems to be a leadership crisis. Who would represent the Kashmiris? No, my brother, there is no any problem of leadership. All the freedom line people, they know who is the leader. Their leader is in the APHC [All-Parties Hurriyat Conference], their leader is also those people who are working in international front for the last more than 50 years. Who have made their contribution, who have dedicated their life. We don't have any dearth of leadership. If both India and Pakistan invite Kashmiris to participate, you will see within a fraction of a minute the leadership will be presented. If they feel mujahideen should participate, we will go. Doesn't matter -- we can go, APHC will go. It will be a compiled one. Two, three persons from here, two, three persons from there, doesn't matter. But you have differences with the APHC. We assure there is no any difference. There is only the different way of interpretation. The people who are working in the APHC, they interpret things politically and diplomatically. Ours is quite different a way. There is mere difference in interpretation. Otherwise, there is no any difference as regards to objective and as regards purpose. We have a consensus. The APHC itself is a divided house. There is infighting between the Jamaat and other 'moderate' elements. [Laughs] We can't say there is any infighting, but there is, ah, there is differences of -- It is called behaviourism. To behave towards a particular issue there is a different ways. It is said Mr [Syed Shah] Geelani [the Jamaat-e-Islami representative to the APHC] is a little extremist. And others are moderate. But actually all the people who are in APHC, they say the same and one thing. They say Kashmir is an issue, 53-year-old issue, which is to be resolved according to the political aspirations of the people of Kashmir. Whether this may be resolved by trilateral process, or it may be resolved internationally covered and controlled plebiscite under UN auspicious or some other agency, whatever. There are only two ways. And all the parties are convergent on this point. There is no any difference of opinion, I don't think. President Musharraf has not been talking of the UN resolution [which grants the Kashmiris the right to choose between India or Pakistan through a plebiscite] of late. I think Musharrafsaab must talk of that resolution. If they are not talking about UN resolution, they are losing the historical bits of the issue. It is the United Nations resolution which provides the basis for this issue, a historical justification for the ultimate resolution of this process. If he will not touch United Nations resolution, then he have not to talk anything about Azad Kashmir, not to talk anything about Gilgit and Baluchistan. Because all the people are satisfied. There is common silence, they are satisfied with Pakistan. The only insurgency, struggle, that is going on is on the Indian side of Kashmir. India has launched an offensive in Kashmir, under fresh rules of engagement. You already have lost a number of people to it, including your chief spokesman Masood. [That's] nothing new to worried about. Indian forces lost their battle and are under constant strain and stress due to increasing target-oriented actions of mujahideen. The martyrdom of commander Masood will escalate the ongoing freedom struggle which is likely to gain more momentum during coming months.